Here's a breakdown of the whole thing in list form. NOTE: Since the time of writing this, the rights to Daredevil, Elektra, Ghost Rider, Punisher, Blade and Man-Thing have all reverted back to Marvel Studios. ORIGINAL ARTICLE: With X-Men Origins: Wolverine a little under three weeks from release, we here at Screen Rant thought an overview of all Marvel properties (and possibilities) might be in order. Though the new independent studio is now producing their own films, solely distributed by Paramount Pictures, there are a number of iconic characters still residing at Hollywood's other major studios. Now that the film division of Marvel Entertainment exists, we've seen questions around the inter-webs about certain properties and copyrights concerning top-tier Marvel characters. Many readers have been calling for Wolverine to cameo in the expected 2012 film Avengers, but there's a little problem with that potential geekgasm. With 20th Century FOX co-producing the Wolvie flick, getting the character to play nice on a self-produced Marvel film is going to be rather difficult. In legal speak, Fox owns a piece of the X-Men film franchise; they have the "rights" to produce any character that frequently appears in the X-Men Universe, projects like X-Men: First Class and X-Men Origins: Magneto insure Fox will be milking that property for everything it's possibly worth. Ultimately, any mutants like Bishop, Cable, Emma Frost, Juggernaut, Havoc, Psylocke, or Quicksilver would likely appear through a Fox-funded lens. But that isn't all - Fox's studio also has dibs on anything Daredevil, Fantastic Four and Silver Surfer. [For the heavy comic book readers, that means a Civil War movie is likely out of the question. Probably any "Marvel Event" is out of the question.] It's been some time, but the wounds haven't healed from the public's viewing of Daredevil and Elektra. A Daredevil reboot (with Jason Statham expressing interest in becoming "The Man Without Fear") was in the pipeline some time ago but recently the project's been quiet. 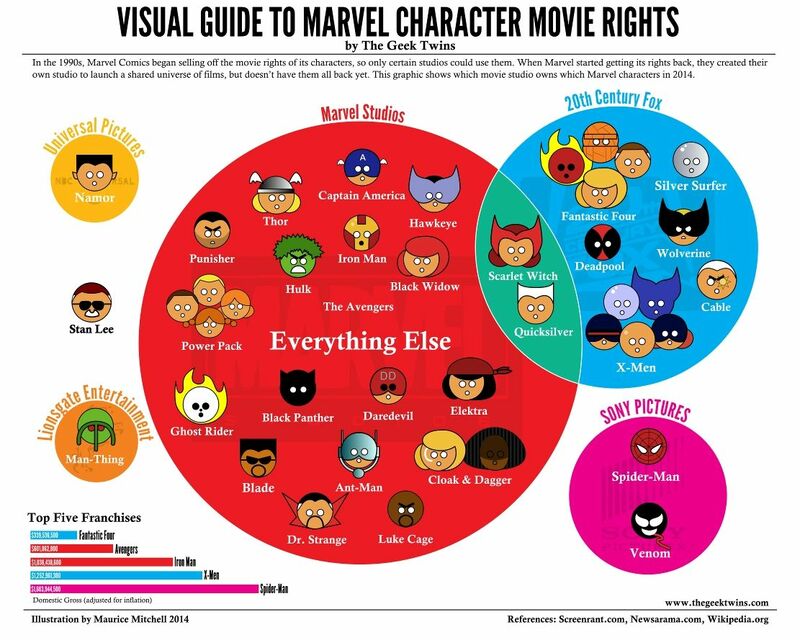 Due to outdated contracts and loopholes, Marvel has their top tier characters at Columbia Pictures, Lions Gate Entertainment, New Line Cinema and the aforementioned, Fox. We've seen the flipping images of Marvel's title sequence for a number of years now. Co-productions between the indie studio and majors began in 1998; now Blade, Ghost Rider, Man-Thing, Punisher and Spider-Man are subsequently licensed elsewhere. Thus, creative control is out of hands of its comic book roots. The first character was Blade, at New Line Cinema. After three pictures and some legal troubles between Daywalker-actor Wesley Snipes and the studio, it looks like that film run is over. Whispers of Blade IV, or a spin-off involving the Nightstalkers, were circulating some months ago but nothing concrete has surfaced. The Spike TV series was canceled due to a number of unconfirmed reasons so the Blade property, at this point, is pretty dead - but that doesn't really stop vampires. As an interesting tidbit (which will be elaborated upon shortly) during an alternate ending of the first Blade, a shadowy figure on a distant rooftop wrapped in rags has said to be the Marvel's resident vampire Morbius. Columbia Pictures (Sony Pictures) is in control of two properties, all things Spider-Man and Ghost Rider. Last appearances of both characters was in 2007, which can explain the seemingly random development updates for a Venom solo project, Spider-Man 4 and Ghost Rider 2. If Columbia has any interest, they can take Black Cat or Carnage and introduce them in the next film; the same applies to Blackheart, Abigor, Wallow and Gressil. As a general rule, any time a studio introduces a comic book character, they have the rights to produce a spin-off or include that character in a sequel of some fashion. So Morbius, who Spider-Man director Sam Raimi has said to be interested in interpreting, may have some problems if the character isn't cleared with New Line Cinema. If Columbia Pictures wanted to be a little ballsy, they could go after the entire Blade package and shoot Midnight Sons--the fictional team of Ghost Rider, Johnny Blaze, Blade, Hannibal King, Morbius and Doctor Strange. Wait... then again, should another studio (that's not Marvel) be in charge of a project like that? Never mind. Marvel also has regained the rights to Luke Cage from Sony Pictures, so the possibility of a Heroes for Hire movie with him and Iron Fist is not out of the question. Universal has the rights to Namor, but they may be willing to let it revert back to Marvel in exchange for distribution rights. And the final studio that's exercised Marvel film property, responsible for 2005's Man-Thing and last year's Punisher: War Zone, is Lionsgate Entertainment. After a quiet release, there's been little movement with nature's monstrous creature. There are few characters independently introduced through the Man-Thing comics, so there isn't much to do in terms of a spin-off. Elsewhere, Frank Castle may be up against Barracuda in a possible sequel but no official release has been issued by the imprint. The lackluster reception, being the lowest grossing film based on a Marvel Comic property will do that to ya, gives high hopes that the project will be moved elsewhere. Keep in mind the project was just last year, so if you had hopes of Wolverine and Punisher sorting out their differences on the big screen-like yours truly-it'll be some time. The initial financing deal, for Marvel Entertainment, Inc., consists of $525 million for the possible production of 10 films, based on its comic book properties, over the next seven years. The debt facility will fund initial development, including scripts for each production, and they maintain sole "green light" control. Understandably there are some restrictions to taking a loan, Marvel cannot withdraw profits until after the release of the third film and only if certain financial parameters are met. The original properties for those 10 films, announced in the press release, were Captain America, Nick Fury, The Avengers, Black Panther, Ant-Man, Cloak & Dagger, Dr. Strange, Hawkeye, Power Pack and Shang-Chi. In the original press release, the budget's ceiling is at $165 million and can have a "rating no more restrictive than PG-13." The explanation of why Marvel had been doing everything on the cheap was apparent from its initial deal. Looking forward, Marvel can regain their characters but it'll be nothing short of jumping through a ring of fire. The studio can shell out truckloads of cash to buy them back or wait for box office numbers to be so bad the studio that owns them doesn't have any interest in following them up, ie. Ang Lee's Hulk (thanks, Universal!). Not meeting a deadline for filming the property is the easiest way - most of the contracts have a clause that allows the rights to revert back to Marvel if principle photography doesn't begin by a certain date after the initial release or if they make an upfront payment as if they were going to start principal photography. This, in part, is the reason we see studios releasing films in rapid succession. The possibility of Marvel having complete control of their character properties, like its comic rival DC, is a matter of time.